Have You Ever Been Afraid of Confronting Someone You Love Because of the Risk of Having a Shouting Fight was Too High? Been burned in hurtful disputes with loved ones in the past? Are you unsure of how to respond in a way that preserves your rights but does not destroy the relationship? We all have been in conversations that turned sour: you say something, the other person hears it in a way that is considered offensive, then he reacts with a strong put down, you defend yourself from the unexpected attack, and then we have a shouting match. Now, we are not in talking terms anymore, and trust is gone…You wonder: how did it happen? Where is all this anger coming from? How could I get carried away into this painful fight with a person I love? There is the pain, the confusion, and the hurt feelings…how could this person that I love so much say such horrible things? Where do we go from here? How to repair the deep wounds left? Is it better to leave or to stay? This situation of helplessness dealing with personal conflicts is the result of a lack of skills…Of all the issues you have learned attending schools, conflict resolution techniques were sorely missing. Now you can learn how to turn around difficult confrontations, and use them as opportunities to create trust, bond and closeness. There is a lot of positive energy to be tapped through conflicts, but only if you see them as indicators of the necessary changes you both need to make to live better. Once you understand the true meaning of your conflicts, you will be in a unique position to use this energy for growth in your relationships in a way you never thought possible. The ebook: “The Art of Positive Conflicts: Transforming Confrontation into Relationship Harmony” is the result of my experience using dispute resolution methods to improve interpersonal relationships in the workplace, and in the family. During my practice of 34 years as a therapist, coach and mediator, I have helped people like you understand and rethink their conflicts in a positive way thus transforming their lives, restoring relationships, and leaving behind negative habits that led to painful confrontations. Once people like you understand the basic principles, they are able to see through the pain and move on. There are issues (deeply hidden) played out through confrontations, and once you see them, you will act differently and know how to respond. With my experience I have also realized that most of the time the root of the problem is that you possibly never had the opportunity to learn and understand the necessary skills to deal with your conflicts. Your parents and teachers did not have access to this information, and you had to learn what you apply today by collecting pieces of information, based on your “trial and error” own experiences. As in our society it is not easy to express directly our feelings and desires, you were left to guess the real issues inside each confrontation, without even a chance of validating afterwards what you learned in the process. And to make things worse, your partner may have the exact same problem! If your relationship is suffering from each confrontation and not only the issues are left unsolved, but you also have to deal with the pain of the dispute, you are probably using the wrong methods to manage these problems. You are not alone, millions of us have been raised in an environment where we were told to deny or avoid conflicts, never to solve them. The problem is, we don't know better, and so apply ineffective techniques all the time, making the situation worse! It is no surprise that we end up afraid of negotiations, running away from confronting other people with respect, and more isolated in the process due to skills that were never developed. There are now several excellent techniques which do work to solve our differences. This “Art of Positive Conflict, Transforming Confrontation into Relationship Harmony” book, available NOW for the small cost of $ 39.97, will teach you the skills, so you can have the right frame of mind and use the skills when you need to solve disputes. Which situations are in need of positive conflict techniques? "The turn around in our relationship has been simply amazing!" This kind of conflict can destroy a marriage, a partnership or a family relationship fast. Now you have a fresh approach and a new tool to rescue your relationshis. Keep reading to find the solutions to problems that have followed you for a long time. The methods proposed here really deliver results! You are probably making critical mistakes managing your personal relationships by using what you knew all your life! And you don't realize now that this is happening to you! It is not enough for you to learn how to communicate better. You'll find that that simply teaches you to fight better. Give up using logical arguments about why is the other person who should change!. That always turns into a battle of opinions, and neither of you is likely to change. Especially if either or both of you are stubborn, and care deeply for the issue in dispute. But don't give up on your marriage or relationship if this is now your critical conflict! No matter what kind of problems you are having, this information applies to you, and in virtually all cases, the results will surprise you. There is an alternative to giving up the negotiation in despair, or prevailing by force on your loved one. In fact, with this new, respectful way of relating to each other, you could soon be experiencing the relationship you've only dreamed about! You can't afford to waste more time in useless suffering! Don't waste another moment on ineffective methods causing your relationships more harm than good. You have tried whatever you learned at home (like denial or silence, which caused you more problems to begin with); then you used friendly advice that put you en positions of either giving up or imposing your power over other people; thus causing you to be left again alone and behind. What do you want now? You can't afford to be ignorant of the same methods that will guarantee that you will be respected by your loved ones. You're still stuck with the same old unresolved arguments and problems in your marriage. Now, you need to ditch that old way of quarrelling, that is destroying the love link day after day. Most people who try to help you with your marriage give you advice that usually ends up causing more harm than good, because the basic misunderstanding gap is never healed. What if you don't know how to fight? What if you where raised in a culture that discouraged self-expression, so you do your best clamming up? Anyone who tells you that all you need is love for your marriage to work doesn't know what they're talking about. Just because you have love for your partner doesn't mean you can stop the fighting and having disagreements, because you don't know how to deal with built up anger. Don't forget the painful words said to each other in the heat of a fight, because once they have been said they can never be taken back, not even with a "I'm sorry"! And we remember for a long time the sting of a hurtful put down! In fact, relying on continuing in the same way as you are now, will frustrate both of you and end up putting more stress and pressure on your relationship, making it impossible to make changes! How to communicate different positions with respect. What the rules for fair fighting are, and how you can apply them. How to become a team when really listening, even when you feel like confronting. How to deal with disputes escalating out of control. "I am amazed with your fresh and direct approach! After reading POSITIVE CONFLICTS, I have a whole new outlook on how I was "attacking people" in my relationships…. without having the least idea of what was going on! Now, I am prepared to apply the fair fighting techniques in order to have a good marriage. I tried the techniques also at work, and they produced beautiful effects on my co-workers, because now they listen to me". “I have been perceived as a difficult person all my life, and now I was able to identify what was wrong in my approach to others….What a turn-around! My relationships have begun to reverse 180 degrees and moving in the RIGHT direction! Now I can really listen, see the other point of view, negotiate better...This is the way I always wanted to connect with others, so my heartfelt thanks to you”. This book is available via instant download! You can be reading this book and be well on your way to DEVELOPING YOUR OWN CONFLICT SOLVING MASTERY in 5 minutes! Even if you have never downloaded anything from the internet before, you will be able to download by following instructions; it's so easy! 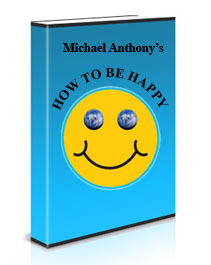 In Michael Anthony latest book "The Happy Book" you will find the keys to a successful pursue of happiness in your personal life. This is a very powerful book, that will really take your way of thinking to a complete new level. 'Develop Self Confidence and Lose Your Fears', a US $39.97 Value. By Beth Ferree. In today's world it's essential to have self-confidence. Living in fear only holds you back from realizing your dreams. This ebook is full of valuable information and exercises designed to help you live more fully. You can benefit of my expertise in Conflict Resolution and Coaching, because for the people who demonstrate a strong interest in solving their conflicts BY buying this powerful book, I want to provide even more: MY PERSONAL HELP! I will answer your personal, direct questions. You will be able to email me and ask specifically what you need help with. But act now, because I can answer personal questions ONLY from the first one hundred buyers of POSITIVE CONFLICTS! After you click the “Click Here” link below, you will be taken to a secure server page. PayPal will take the information to complete the sale (less than a page), and verify your credit card purchase. You will then be taken to a download page, where you will get instant access to the information. Follow a couple of simple steps, and the information will be in your hands. And don’ t worry, the download page will walk you through accessing the Electronic Book. See how easy it is? you can have this important Electronic Book in your computer almost immediately and with very little hassle! That’s right! Take 3 months to use and examine my crucial information, and techniques. That’s 90 days to put these valuable strategies to work on your Relationships. Try the techniques yourself. Try as many of the tips as you can. Once you have used these strategies on your relationships, I’m confident that you’ll NEVER want to send it back! But, if you aren’t satisfied for any reason, or it doesn't live up to your expectations, just send me an email and your payment will be refunded. Right up to the final day of this 90 day guarantee. No questions, No hassle. "The Art of Positive Conflicts: Transforming Confrontations into Relationship Harmony"
You'll receive a step by step guide showing you everything you need to know about conflict solving and how to rescue your relationships and get back on track towards having the relationship and life of your dreams. No need to spend all of the years and heartache to achieve success. Just follow the instructions and start getting results with your marriage situation immediately.. And with the instant money-back guarantee provided, there is literally NO RISK for you. Start your building your relationships today! Yes, get immediate access even at 2:00 A.M.
“This Electronic Book has been such a revelation! I was always blaming others for my relational problems, without realizing that doing so I was giving away my own power of framing the situation in a way more positive for my own needs....After overcoming this personal shock, I could not stop reading it, and feel so much better about myself and my intentions". "I can tell you this so far...I realize now that I have been negative and confrontational with all my relationships, when I could be doing instead more positive framing of both sides of our proposals! But now I feel encouraged knowing that I'm giving personal change my best by reading your Electronic Book, and understand that I have exactly the tools I need to make my important relationship not only more satisfactory, but also full of zest and joy”. PS: HERE ARE YOU, STILL THINKING…Do I have to remind you of all the conflict misery you have been through before? This is the best solution to solve the pain of fighting in your relationship! For only the small amount of $39.97, you can have in your hands the solution. Buy the book now, read it, highlight the aspects that talk directly to your situation, write down a couple of personal questions, and send them to me…You will have your personal coach telling you exactly how to solve your conflicts and live in peace in a very short time! Isn’t this the change you have been dreaming of? PPS: And, remember that if you decide that this is not exactly what you need now, you can always return it, get your money back and lose nothing….isn’t this a wonderful opportunity to do something that will change your life for good? Imagine yourself in all your relationships, being able to be calm, never upset by anything others say, listening to others, helping working out the right solutions and being appreciated for all that…It sure beats feeling miserable, shoved in a corner and shouted at by others who sense you have no power to project yourself as a person immune to confrontations, right? Get the book NOW, it is a very low price for the peace of mind it will provide you, so you can be in your way to be a conflict solver in your love life!